Here's a more detailed map. We have limited car parking, the Church’s small car park is reserved for Church members and we cannot guarantee parking spaces for room hirers. Note that there is absolutely no parking on the pavement outside the rear doors. Vehicles parked there create a fire escape hazard and will likely get a parking ticket. There is a convenient entrance to the The Glades car park from Glades Place (which runs down the side of our building) and there are other public car parks in Bromley. Bromley URC is well served by public transport. The following buses all stop outside the front door or nearby: 61, 119, 126, 138, 146, 162, 208, 227, 246, 261, 269, 320, 336, 352, 354, 358, 367, 638. 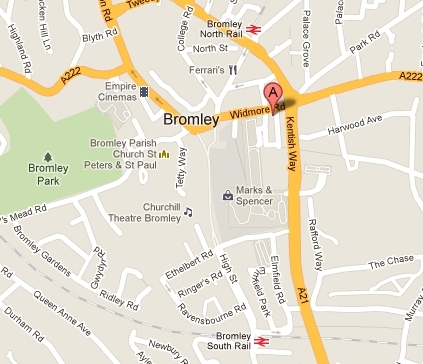 Trains: Bromley North and Bromley South stations are both a few minutes walk away. A route planner and up-to-date travel information may be found on Transport for London's website. Please note that the church building is usually closed every bank and public holiday, except for Easter and Christmas services. There are no lettings on bank or public holidays. Please direct your enquiry to the relevant officer below. Misdirected enquiries will result in a delayed, or no reply. Bromley URC has a duty of care to all our users and visitors. Please read our Safeguarding Policy.